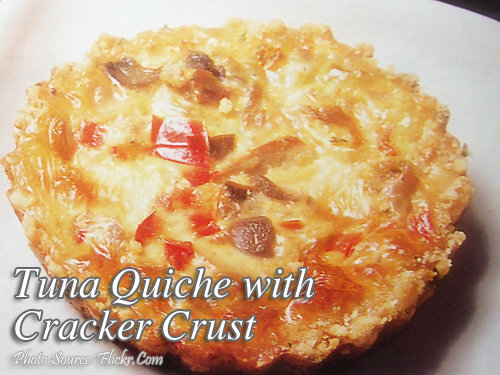 Quiche is a French pastry that looks complicated to make and when bought in a bakeshop, it is quite expensive. But it is simply just a savory custard which is a mixture of eggs, milk, and cheese combined with vegetables and seafood or meat then baked in crust in less than an hour. You will be surprised how affordable and readily available the ingredients are in making this tuna quiche (keesh). This holiday season this can be a nice addition to your Christmas parties or Noche Buena. Try it! To make the filling; In a bowl blend milk, cream of mushroom soup and eggs until smooth. Set aside. Heat oil in a pan and saute onions until transparent. Add tuna flakes and saute about 5 minutes. Take the chilled crust and grate 1/4 of the cheese bar over it. Spoon the tuna over the cheese; dot with pimientos. Grate remaining cheese on top. Season with paprika. Bake for 45 minutes or until toothpick inserted in the center comes out clean. Let stand at least 10 minutes before slicing. Combine crushed crackers and parsley. Add melted butter and mix until evenly moistened. With the back of a spoon, or with hands, press mixture on the bottom and sides of a spring form pan or decorative pie plate. Chill in the refrigerator while making the filling. In a bowl blend milk, cream of mushroom soup and eggs until smooth. Set aside. Heat oil in a pan and saute onions until transparent. Add tuna flakes and saute about 5 minutes. Take the chilled crust and grate ¼ of the cheese bar over it. Spoon the tuna over the cheese; dot with pimientos. Grate remaining cheese on top. Season with paprika. Bake for 45 minutes or until toothpick inserted in the center comes out clean. Let stand at least 10 minutes before slicing. So…I didn’t have parsley so I used hyssop. Didn’t have condensed soup, so I used non-condensed soup but omitted the milk. Didn’y have cheddar, but only leftovers of Havarti and mozzarella, and it all came out so tasty still. Hi Elka, thanks for sharing your experience! Hope you come back often.